We hope 2014 finds you healthy and happy and taking life a bit less seriously. We also hope your 2014 includes a resolution to go for those pursuits you enjoy, and that also can bring you the prosperity to enjoy them full time. And we also happen to think creating your own TV series and selling it would be an awesome way to achieve that resolution! …To start 2014 off right and join our Hit Maker Tour to one of the three most important television conferences this year. 628 channels are waiting for content. Give yours a chance NOW! The first official training session is Thursday, January 16. It’s not too late to get in on the action. This is the year to really MAKE IT HAPPEN! CALL 407-351-0893 or email team@selltyourtvconcept.now for rates to each conference and more information. There are THREE major conferences coming up LATER THIS MONTH. Choose the conference best for your type of show. Your best bet is NATPE Market and Conference, National Association of Television Programming Executives, in Miami Beach, Florida, running January 27-29. Tony and Jeanne have a brief meeting before a networking event at Realscreen Summit. The absolute best way to get the most bang for your buck out of a television conference – to have the most effective pitch; to make the most contacts; to know what to do or follow up with those contacts – is to join our Hit Maker Tour and have a mentor or coach on site who knows how to work the conferences inside and out. To have a pro on your side. Pre-conference training! You haven’t missed any training! First training session is January 18th! On-site mentor to go to pitch meetings with you, help you perfect your pitch, strategize and network. Find out all of the insider places and opportunities to meet industry execs and agents where big deals get hatched. travel tips and much more. Exponentially increase your chances of selling your show! and leave your name, phone and best time to reach you. FAST-ACTING BONUS – Don’t forget to also ask about our exclusive Hit Maker Tour CLOSED DOOR SESSIONS. They take place the night before every conference and it’s your chance to pitch producers and executives. You’ll definitely get great feedback…heck, you might even get a bite before the conference begins! Here’s an excerpt from Mark’s latest article for the Toon Boom News. Storyboards often have to be drawn on location. Sure, we all like working in our dark studios, but even we artists have to see the sunshine at some time. I stopped using paper years ago with the advent of Storyboard Pro. It’s easy enough to still work digitally on location with my laptop and portable Cintiq, but the equipment can get heavy and I have to have access to an electrical outlet to plug in my 13-inch Cintiq. However, Wacom has finally developed the dream machine tablet, the Cintiq Companion. And I got my hands on one before it was released to the public. Since Storyboard Pro and many other graphics programs are processor intensive, I set the performance and power levels to High Performance even when it’s running on battery. The entire SYTCN team had a hand in helping prepare creators Laura and Rob Small’s original animation project “Thunderbolt Boomerang” for a major push during the upcoming Kidscreen Summit television conference in New York. Mark is producing the Animatic and designed the characters; Wayne did the final revised draft of the script; and Jeanne is coaching the Smalls on their pitch and presentation. We look forward to big bites for this captivating kids’ show about a girl and her pets who lead a secret double life magically transformed into interplanetary Pop Glam Rock stars. Jeanne is also in deep development doing the treatment, edit and layout for a pre-school animation project. Stay tuned for more details. WORKSHOP REPLAY DISCOUNTS NEXT WEEK! Our first New Year’s special is coming this week with great discounts on replays of our most popular virtual workshops. This week and next week look for special 50% off discounts (a steal!) on these virtual workshops, which are perfect preparation training for protecting your project, attending a television conference, and marketing or selling your script or project. Look for emails next week announcing the 50% off discounts are active! Apparently a lot more of us were watching Downton Abbey. Last year the show premiered on PBS Masterpiece Theater in the United States with 7.9 million viewers and peaked at 8.2 million for the finale. Season Four, which just started January 5, pulled in a record PBS audience of more than 10 million – the highest ratings for PBS since “The Civil War” (The Ken Burns’ documentary, not the actual… you know). Looks like the Granthams will be around for awhile. Wonder if the actor who played Matthew and chose to leave the show so unceremoniously last year (or as creator Julian Fellowes chose to dispatch him) will be able to say the same for his career. Wayne binge-watched the first season of BBC’s Orphan Black during the holidays. Actress Tatiana Maslany, who earned a Golden Globe nomination for the series, plays a hustler (think Dragon Tattoo girl) in Ontario who discovers she’s one of eight clones who were created and are being mysteriously eliminated one by one. Maslany has a field day playing eight different personalities from Ukraine punk to suburban soccer mom to lesbian scientist nerd. Some scenes feature 3-4 of her characters interacting in an amazing display of technicality plus acting marvelry. Season Two starts in April on BBC. Luke and Reece watched a marathon of Ridiculousness on MTV, a show which simply categorizes and shows clips of outrageous ‘Jackass-style’ clips from YouTube and has a host and celebrity panel react. It takes America’s Funniest Video groin kicks to an entirely… low but funny level. Considering most of the young generation gets their entertainment from YouTube, this is a smart and cheap way to hit that demographic. 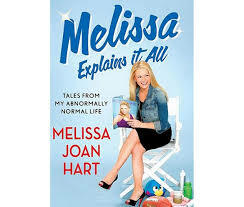 Actress Melissa Joan Hart has a memoir out called “Melissa Explains It All,” which includes memories of her time at Nickelodeon starring in Clarissa Explains It All. 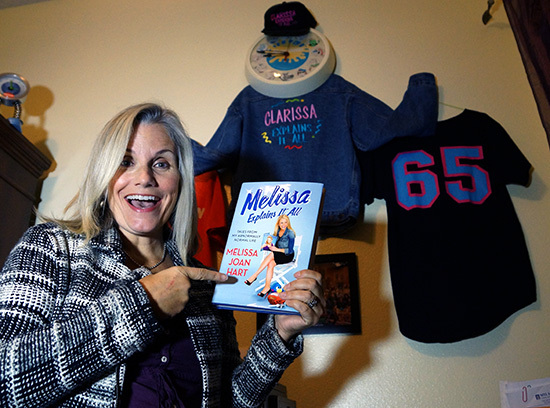 Jeanne was a producer on that show, which launched Melissa to stardom, as well as producing other shows at Nickelodeon including Roundhouse, Gullah Gullah Island, and Allegra’s Window.